Your bags are all packed, the GPS is set and you have hit the road for the classic cross country family road trip, but the question of the day is what do we do for all the hours in the car? 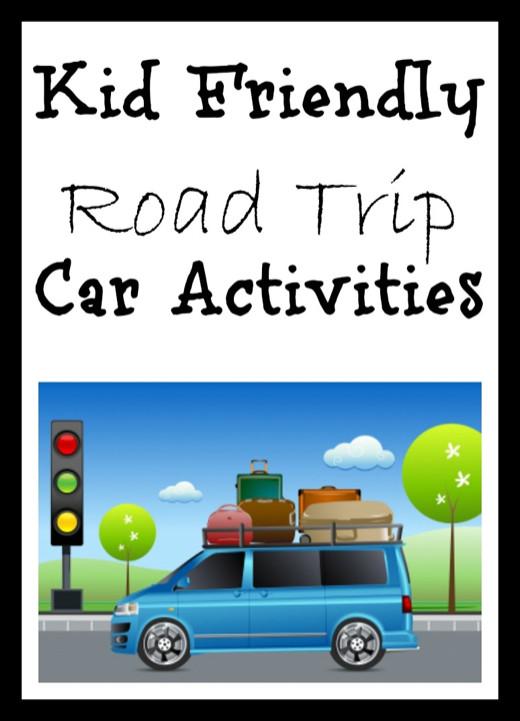 Traveling with children can be both fun and overwhelming but these Kid Friendly Road Trip Car Activities will help keep everyone happy, occupied and smiling the whole way. SING A LONG: Cliché or not road trip songs are tons of fun to experience with kids. Whether you make a “mixtape” of your favorite current hits, download tons of old school and classic rock or grab a few of the kids silly song albums there are many ways you can use the classic fun songs to create a fun atmosphere while traveling. Turn the classic 99 Bottles Of Beer On The Wall into a new version of 99 Baby Bottles On The Wall. I SPY: While this works best with the younger crowd it can be fun for the whole family. Watching for fun or different things on the road to “spy” can help their imaginations, keep them occupied for hours and of course result in tons of giggles from everyone in the car. COUNT THE SIGNS: Challenge your kids to count the signs between mile markers or from a certain point and your next pit stop. Keeping track of what number they are on will inevitably keep them busy and result in far fewer questions for you along the road. READ OR LISTEN TO BOOKS: If your kids are currently in to a specific character from books or movies grab a few new books or books on tape for them to listen to. If you have good readers that don’t get motion sick while in the car make sure to pack books for them to read quietly to themselves. PACK A LAP TABLE AND ART SUPPLIES: It may sound messy but grabbing one of the $5 lap tables available at most dollar stores and a few things like foam shapes, construction paper, crayons, markers, pipe cleaners and glue sticks can occupy hours of time while on the road. Make sure to keep wet wipes and trash bags on hand to clean up any small messes made. LICENSE PLATE CHALLENGE: Have the kids watch the cars passing by for different state license plates along the way. Whoever can spot the largest variety in a set time period gets a prize or gets to choose the next playlist you put on to listen to. WATCH MOVIES: If all else fails go to the standard of using your portable DVD player and their favorite movies for a few hours of peace and quiet. If your kids don’t like the same movies invest in headphones and separate units for each of them. Planning ahead with a list of activities, songs and easy things for your children to do in the car will make your family vacation much more fun and relaxing. These kid friendly road trip car activities are just the tip of the iceberg but are an excellent place to start. Always remember no matter what you do that a willing spirit and heart that is open to just going with the flow is the best thing to pack for any vacation.